Sure, sure, some would say that Exxon was “stealing” from the American public. But you saw how the hurricane devistated the country! 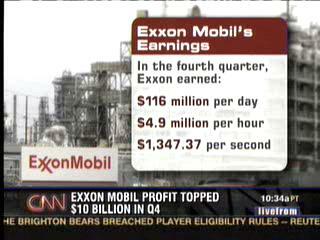 The executives of Exxon were simply taking what they needed to feed their families….. if you call that gouging, then you are just heartless. And unlike the stranded citizens of New Orleans – who were heartlessly and needlessly looting when plenty of relief materials were available from FEMA and the Red Cross immediately after Katrina – the Exxon executives didn’t leave such a mess up and down Burbon Street. I mean, how else do you expect them to pay for their children’s Ivy League educations and million dollar golf outings? And that oil spill was really just a big misunderstanding. Really, Juicio. You’ve gone TOO FAR this time.